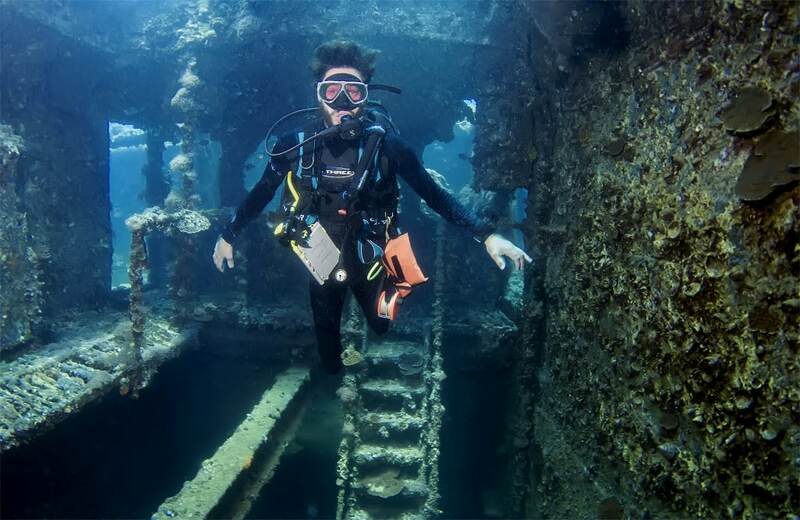 The final part of Gary Green’s account of the Deptherapy Red Sea Military and Forgotten Wrecks liveaboard expedition. The last dive of the trip; it wasn’t far away and it was part of the same reef where we had undertaken our check dives on the first day. I would personally nickname this dive ‘the aquarium dive’. I have honestly never seen a reef like it; there was more life on this reef than I have ever seen on any other dive. There was also something I had never even seen before, a porcupine puffer fish (if that is 100% the correct name? I have it on my GoPro) it was absolutely enormous. It was hidden away in a small hole in the middle patch of coral. I looked down the hole and there it was just swimming out towards me, its head absolutely massive. I was completely stopped in my tracks as I watched this giant creature bob itself back and forth. I also encountered two giant morays, the absolute dragons of the sea. No matter how many times I see them and dive with them, I never quite feel comfortable seeing their faces. Apart from the monsters already mentioned, everywhere you looked was just full of life. It was a case of every time you looked in a different direction there was something else to see. It was like the worlds’ richest and biggest sea life centre, a bit of everything all thrown into the mix; not only that but the colours of the coral were breathtaking; like most of the Red Sea to be honest but somehow here everything just seemed even brighter. I can’t think of a better way to spend our last dive than in the presence of some of the most beautiful creatures known to man. In fact, that dive summed up the whole trip for me… a relaxed dive underwater, having the privilege to spend time in the most secret of all gardens, the coral gardens. The host and hostess with the mostest – I think that’s the term anyway! I may have to double check. Steve and Clare have been with Deptherapy for a long time, long before I was involved with the charity in any case. I first met them at the Dive Show a few months before I flew out to Roots for my Open Water Diver course back in 2015, not something I would easily forget. Their place in Roots is one of the most spectacular in the Red Sea and the house reef is where I learned to dive and where I was fortunate enough to have dived with a pod of dolphins that had come into the reef to feed. The resort camp (Roots) sits between Safaga and El Quseir; it’s remote in location, which means when you are diving you have the reef to yourself. Once you follow the line out you are within an underwater aquarium absolutely full of all the sea life you could ever wish to see. In the reception of Roots there are plaques along the wall of all the different regiments that the injured troops have served in. Both Steve and Clare are seasoned divers (being very tactful with my words there) and during this trip Steve often gave tours of the wrecks that he was well accustomed to. Clare also helped out on our dives, often being a buddy for Ben in the strong currents when he was struggling due to the fact that he has no legs to propel himself. I didn’t realise at the time but Steve is a fantastic underwater photographer. He displayed the pictures that he had taken on the TV screen in the briefing room and a lot of the blokes were surprised at just how clear they were. I watched him in the water a few times as he dived with us, like most of the pros team, they are so comfortable in the water, flawless in skill and effortless in technique. 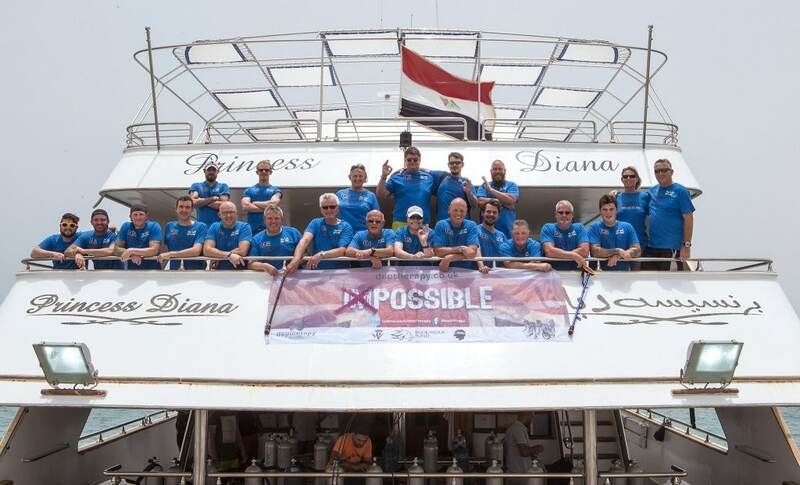 Steve and Clare had chartered the Princess Diana for Deptherapy to make this liveaboard possible. I’m sure that if it wasn’t for them taking time out of their busy schedule (Clare seems to almost fill hers with sunbathing) then I’m not sure if the trip would have ever met its ambitious goal, or at least I am certain it would have been a lot harder. The only downside is that Steve is a West Ham fan, but as they say you can’t win them all! I think in time I may be able to slowly but surely convert him to the Mighty Reds and by that I certainly don’t mean Liverpool. In October this year at the Dive Show, they will be hosting their Pharaoh Dive Club Birthday Bash, to which they have generously invited Deptherapy. Steve and Clare are long time (lifelong) friends of the charity who have truly aided its success. I’m not sure they quite get the praise they deserve, ever humble in their generosity, I, on behalf of the Board, would like to thank them. To recap what they have given to Deptherapy: they introduced the ‘Miss Scuba’ organisation to Deptherapy, who have to date raised over £7,000. 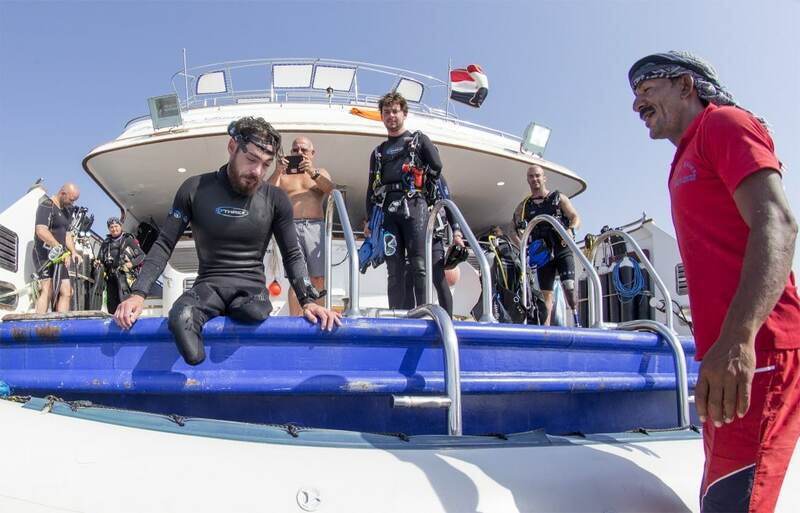 The Pharaoh Dive Club Birthday Bash will raise around £5,000 that they will donate to the charity and they run the Open Water courses for Deptherapy free of charge. 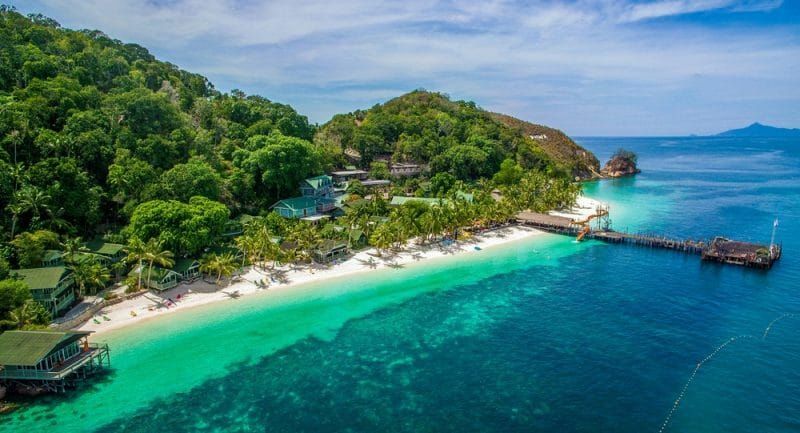 They also ran the Advanced Open Water diver courses free of charge for a long time and they then charged below cost for the courses. Words cannot describe what they have done for the charity. A Russian national who is a prolifically skilled underwater photographer and videographer, Dmitri became involved in Deptherapy through his outstanding work with disabled divers. I had seen a lot of his photos with wheelchairs under the sea with disabled divers who he had taught to dive and raised their profile. He then agreed to come and take photos of the Deptherapy team at work. The images he takes are perfect in both quality and content, highlighting the outstanding way that Deptherapy goes above and beyond in its adaptive teaching. His photos bring awareness and a visual representation of the objectives of the charity, depicting the figures of wounded veterans perfectly buoyant in the Red Sea. Some divers missing arms, some missing legs and some missing both, but still as competent in the water as a fully abled individual. Dmitry takes time out of his life to come and support on the trips, truly capturing the most fascinating of images and profiling the charity in the most inspiring of ways. Deptherapy consists of a foundation of generosity, an idea that was completely selfless, taking disabled (both mentally and physically) veterans and using scuba diving as a form of therapy. 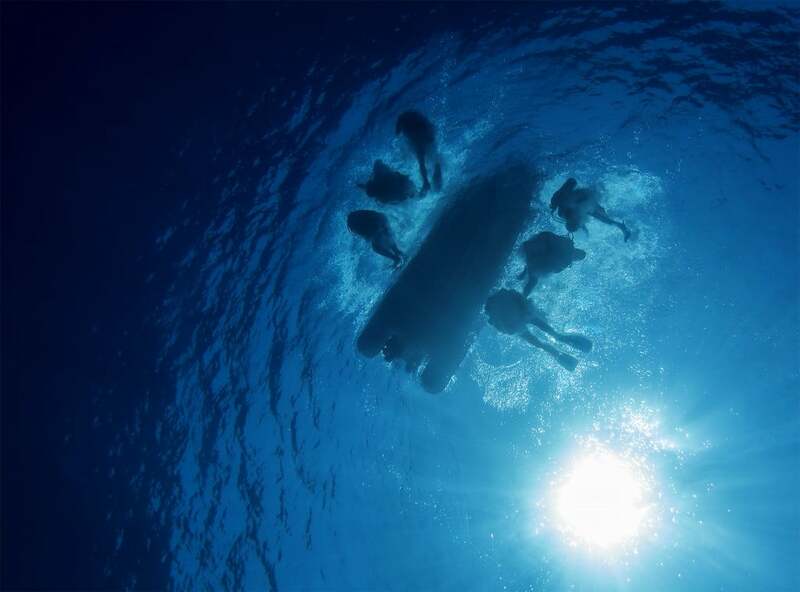 It grew beyond that, it dared to be greater than the original idea; not just to take wounded veterans in the sea, but also to train them as qualified divers. To break past the limits of what people conceive as possible, what some call impossible. Let’s banish the I and the M, let’s make this possible. The team become adaptive, the Master Instructors thinking outside the box to get limbless veterans to perform a Controlled Swimming Ascent (CESA) or a veteran with one arm to remove and replace his mask; they were patient with their innovative techniques. They overcame challenges again and again, guys with PTSD who would have ups and downs, so the trainers became mental health first aid trained and could now coach and guide struggling veterans. They run programmes to teach instructors how to use the adaptive techniques, putting themselves in the students’ position so they can use the most practical and realistic solutions. Doctors joined the board and the University of Sheffield produced a case study proving the success of Deptherapy’s ability to rehabilitate veterans through the medium of scuba diving. 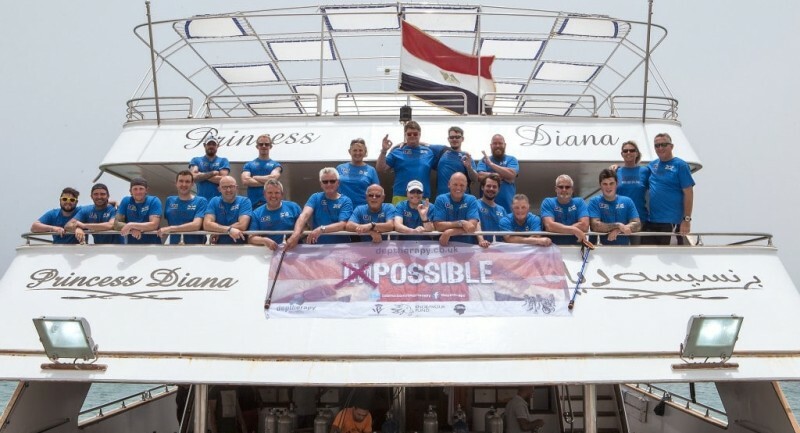 This ten days on the liveaboard was at this point, the charities Everest. It was easily conquered. I witnessed myself veterans with no legs penetrate wrecks up to 40 meters below the Red Sea and come up with big smiles on their faces. At the start of the trip some of us were strangers, there was ring rust in the water on our check dives but within a couple of days we were a band of brothers again and a united team above and below the water. On the Scalaria another dive team went past us from a neighbouring liveaboard. I saw their instructors look at our group, gliding through the water with perfect trim and buoyancy. He looked at the divers he was with, kicking their fins up and down, sculling with their arms and he gave a double take as he saw the guys with no legs gracefully moving through the sea. If there was any testimony to what the Pros Team had done then in my opinion that was it. This Everest was climbed, completed, knocked out of the park and now we move on to the next challenge. In August next year there will be a selection process for veterans who will be taken to Truk Lagoon. Deptherapy has grown strong and is still growing in strength. I have seen with my own eyes, once again, just how amazing and incredible people can be. Well done to everyone that smashed their Wreck Diver Speciality. Thank you to everyone who so generously makes these things happen and thank you to the charity and Instructors for continuing to break the bar on scepticism. Thanks to Dmitry Knyazev for the incredible photographs. Gary Green is an author, team leader and PADI AmbassaDIVER. After being medically discharged from the British Army following an IED attack which left him blind in one eye and with PTSD, Gary was introduced to scuba diving through the rehabilitation charity Deptherapy. 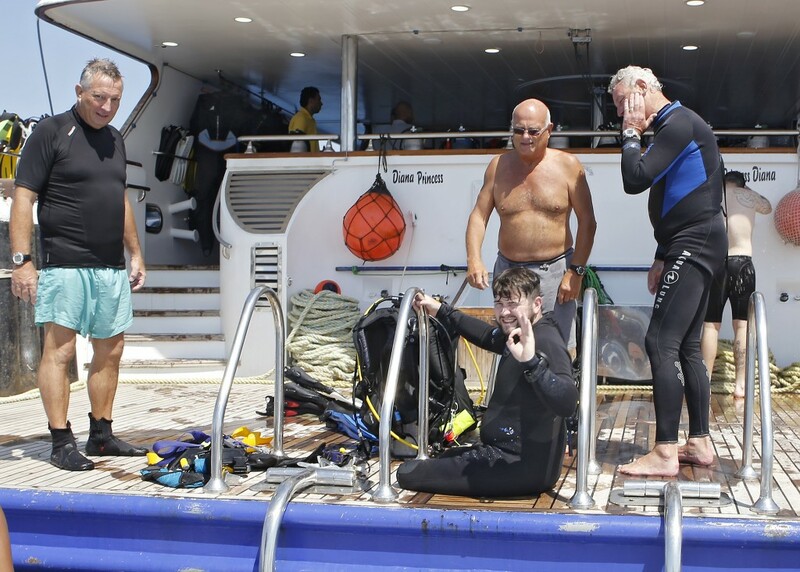 Gary is living proof of the healing power of scuba.